Membership in the United Nations Security Council (UNSC) has been an important element of India’s foreign policy throughout the country’s history. India has been a non-permanent member of the UNSC seven times. As a member of the G-4 (alongside Brazil, Germany, and Japan) in recent decades, it has also lobbied for a permanent seat as part of a reformed UNSC. India’s permanent representative to the UN, Syed Akbaruddin, argued in July, 2016, that an expanded UNSC with additional permanent and non-permanent seats would redress the present “imbalance of influence” in the Council. Critics such as Pakistan’s UN Representative, Maleeha Lodhi, counter that UNSC expansion would be “undemocratic.” Pakistan is a member of the Uniting for Consensus coalition (UfC), whose members oppose any UNSC reform that gives a small set of countries (including India) new privileges. Opposition to UNSC reform also reflects historical politics. The leader of the UfC, Italy, believes it, too, merits consideration for UNSC expansion. The former Italian foreign minister Susanna Agnelli once quipped: “what’s all this talk about Japan and Germany? We lost the war, too!” Pakistan’s opposition to any UNSC reform that benefits India reflects the two countries’ rivalry which dates to Partition in 1947. Despite continued debate on UNSC reform, which since 2010 has taken place in the UN General Assembly on the grounds that the issue is of global public interest, the Gordian knot of reform still awaits its Alexander. While India’s current claim to permanent UNSC membership reflects its status as a nuclear power and a demographic behemoth, it has deep historical roots. The United Nations was central to Indian prime minister Jawaharlal Nehru’s vision of India as an internationalist and modern nation-state, and the principles of self-determination and anti-imperialism that he saw as imperative for India’s, and Asia’s, future. He believed that just as the state could serve as the unifying feature of Indian politics, so the UN could foster international stability on the basis of sustained dialogue and a commitment to international justice. Security Council membership was important to India in the 1940s and 1950s for three reasons. It signalled India’s aspirations to leadership of the emerging Afro-Asian bloc. It provided a symbol that could unite India’s plural religious, caste, and linguistic communities (the compound society about which Nehru wrote in The Discovery of India ), and provide bureaucratic experience for Indian civil servants. Finally, it could secure for India the political leverage to participate in other emerging forums of international governance. Yet, India also lapsed into obfuscation and appeals to its sovereign rights to defend itself against UN and international involvement in its dispute with Pakistan over the former princely state of Jammu and Kashmir. Internationalism was thus a double-edged sword: a useful tool for attacking ones’ enemies (such as South Africa) and pursuing national interests, but also one that subjected the conduct of domestic policy to outside scrutiny. The Janus-faced nature of India’s engagement with the UNSC was most evident concerning Jammu and Kashmir. The First India-Pakistan War began on 26 October, 1947, after Pakistani-supported Pathan tribesmen rebelled and marched towards Srinagar, the Jammu and Kashmir capital, to overthrow its ruler, the Maharaja Hari Singh. He responded by seeking Indian support, which Nehru gave at the price of ceding Jammu and Kashmir to India. Nehru sent troops to Jammu and Kashmir, and on 1 January 1948, on the advice of Lord Mountbatten (then India’s Governor General), submitted the dispute to the UNSC under Article 35 of the UN Charter, claiming Pakistani aggression. After hearing charges and counter-charges from each side, the UNSC passed Resolution 38 (requesting each side to de-escalate) and Resolution 39, which established a three-member UN Commission on India-Pakistan (UNCIP) to investigate the facts on the ground. UNCIP operated from 1948-1950. The British diplomat Sir Owen Dixon (UN Representative for India and Pakistan) administered UNCIP, with the former League of Nations refugee director Eric Colban as Principal Secretary. 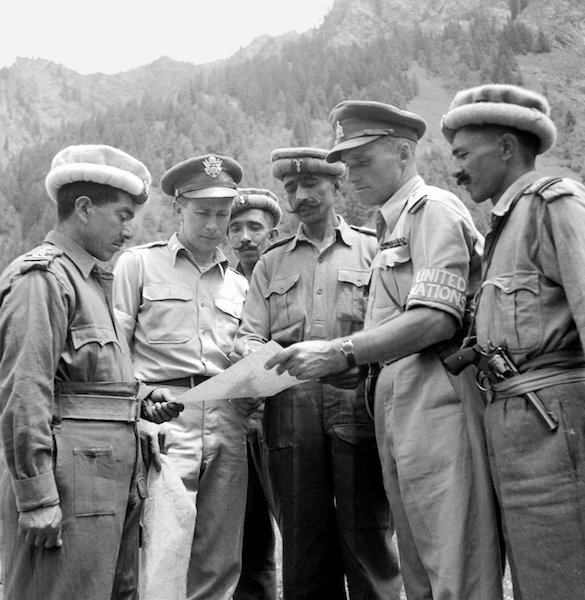 UNCIP military observers, such as the American and Canadian shown in the above photograph, were responsible for mediating a ceasefire between Indian and Pakistani forces, and facilitating demilitarization ahead of the planned plebiscite on Jammu and Kashmir’s sovereign status. The Kashmir dispute challenged the core UN Charter principle of territorial integrity. The UNSC struggled with how to mediate the Kashmir crisis without appearing partial to either side, an early indicator of how its politicization could compromise its ability to deliver on its Charter security responsibilities. One ad hoc response was the involvement of international civil society actors. The experience of international relief in India during the Second World War, and then before and immediately after Partition, was an important precedent. Among the very few aid workers whom both Pakistan and India allowed across the border to provide relief to refugees and displaced persons after Partition were Quaker relief workers, including Gandhi’s friend Horace Alexander, deemed neutral on religious grounds. Kashmir was also important personally to Nehru, whose family were Kashmiri Brahmins. He believed that the incorporation of the Muslim-majority Jammu and Kashmir into India would validate his secular, pluralist national-vision. The Indo-Pakistan dispute undermined this goal. It also complicated India’s 1949 campaign for election to a non-permanent UNSC seat. As he told the Canadian High Commissioner to India, J.D. Kearney, and other correspondents, Nehru was deeply disappointed with the UNSC resolutions in the belief that they favoured Pakistan. The UNSC’s refusal to defend Indian sovereignty in what Nehru believed was a clear violation of Article 35 of the UN Charter left him concerned about its greater utility as an instrument for maintaining international peace? Beyond allowing UNCIP and UNMOGIP continued, India resisted further international intervention in the Jammu and Kashmir dispute on the grounds that it was a sovereign matter. Recourse to this argument ironically aligned India with the colonial powers’ standard defense when their colonial administrations were attacked at the UN. The dispute over Jammu and Kashmir continues today. Given India’s and Pakistan’s nuclear capabilities, it is one of the world’s most dangerous territorial disputes. It can also produce almost farcical conflicts, as in the Jammu and Kashmir Criminal Investigation Department’s investigation in October, 2016, into whether 123 pigeons brought across the border from the Punjab into Jammu were designed for espionage. While UNSC membership continues to preoccupy India’s foreign policy elite, some Indian observers have recently declared the UNSC redundant. They have lobbied for India to instead pursue bilateral relations and membership in new sites of global governance outside the transatlantic orbit, such as the China-led Asian Infrastructure Investment Bank (AIIB). Such views are a response to the UNSC’s history of impasse and indecision, but also reflect India’s historical involvement in “South-South” networks of international governance dating to Nehru’s Asian Relations conference in 1947. For India, the UNSC has at various times been an international venue which has accorded it international status and influence, a forum in which India and other developing countries have remained in postcolonial positions of sufferance, and an institution that could be ignored or bypassed as the country pursued a position of leadership in Afro-Asian governance networks. United Nations Photo # 83976, 01 January 1949, Kashmir.